If you haven’t been to Laguna Lake, you’ve probably at least heard of it. The century old artificial body of water is located just east of Euclid Avenue next to an equestrian center used by area horse enthusiasts. The neighborhood surrounding it is an affluent one of mostly single story estates with plenty of greenery, but people from all walks of life enjoy the lake. Whether fishing, speeding by on a mountain bike, feeding the birds, or just enjoying a stroll on the shore, Laguna Lake has become one of the treasured places of respite for generations of Fullerton residents. Over a decade later there was another surprise announcement: Since the 2004 renovation, Laguna Lake has been losing 90,000 gallons of water a day, and has to be constantly refilled through a two inch pipe to keep it from drying up. And, because of its location, the lake is fed by Metropolitan Water District water, the most expensive the city purchases. Naturally, some water evaporates, and the lake would have to be topped off regularly anyway, but a much greater amount of water is being lost to something other than normal evaporation, and nobody seems to know where it is going. The revelation of the huge daily water loss came during a water savings plan agenda item before the Fullerton City Council on May 19, when the Parks and Recreation Department recommended turning off the tap to help comply with drought restrictions throughout the city. What was especially surprising to hear was that the city staff evidently had known about this massive leak for at least five years. One council member commented later that they had never been told about it. City Engineer Don Hoppe explained during the May 19 meeting that no source had yet been found for the leak, despite divers having been sent down into the lake with dyes to discover where all of the water was going. He speculated that several feet of duck “butter” might have acted as a seal during decades prior to the scouring of the lake bed in 2004. Just a week later, during a question and answer session following his “Mini” State of the City presentation at the Fullerton Public Library, Mayor Greg Sebourn cited 100,000 to 150,000 gallons of water escaping the lake each day. The significant discrepancy between the lower estimate and the six figure ones can presumably be explained by the higher evaporation rate during summer months. The plan presented on May 19 recommended simply shutting off the tap. Naturally, area residents were not thrilled with the idea of letting the lake go dry. Dozens of them attended the meeting to voice fears of crime and stagnant water breeding mosquitos that might carry West Nile virus, a serious concern, to be sure. Several area residents in attendance asked why the lake had not been lined when the costly and time consuming restoration had been performed years before. Engineer Hoppe explained that the strategy was to keep the lake in more of a natural state. A mystery akin to finding the source of the Nile in the 19th century now occupies the city hall as they try to find out what is happening to all of that water, but it isn’t the only mystery at hand. The other is, why wasn’t anyone outside of the city government aware of this daily disaster until now, until all California cities were required to present plans for reducing water usage? 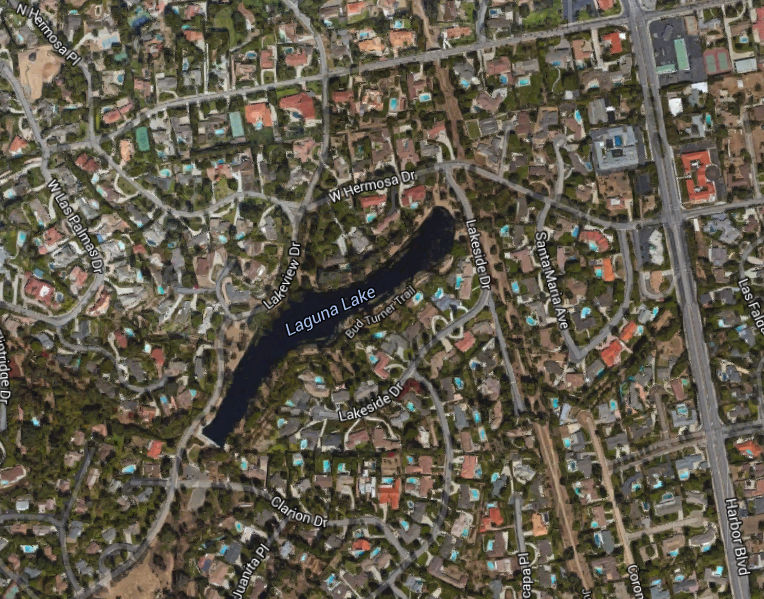 An article in the OC Register noted that Laguna Lake is now the city’s largest water user. What the Register didn’t note was that “the city” doesn’t pay for any of it, you do. The cost of the water is spread out among all of the paying customers. And, remember that you, the ratepayer, are already paying extra money on your bill each month to lease the water department’s land, even though the water department is part of the city too. For that double charge you’d think we’d at least deserve to know about such a huge and longstanding problem. Ultimately, on May 19, nothing was resolved, and the matter was scheduled for reconsideration at the next meeting, scheduled for June 2. Disperse materials to trace the leak. Described as relatively inexpensive, but it may not stop the leaks. Drill into the water around the lake, rescue the water, if it’s available, and re-use it somewhere else. But it may not be found, and could create more problems, like accelerating the leakage. And the water may not be safe for other uses anyway. Drain it, scrape it, and re-line it. Try to save the appearance and habitat. Everything would have to be stripped, and, more than likely, the lake would not look like it does now. Mr. Hoppe explained that when the 2004 renovation was performed and the lake refilled, it was thought that the immediate water losses, apparent even then, would diminish as cracks in the clay underlying the lake were filled in, creating a new seal at the bottom. But the water just kept leaking, and hasn’t stopped since. At least, Mr. Hoppe made it clear that they would not be using the same consulting firm from the 2004 renovation this time, although they had actually been approached by them recently. The middle of California’s most severe drought in 1,200 years, by some estimates, is a terrible time to be caught with a persistent and significant water loss in a non-essential recreational lake. It is troubling to think that the problem might not have come to the public’s, or even the City Council’s, attention had the city not been faced with planning for unprecedented state mandated cuts in water use. If we base Laguna Lake’s daily water loss on an average of 100,000 gallons per day, it has been losing 36,500,000 each year. This is a significant problem that few people were aware even existed a month ago, but just because it’s been happening for years doesn’t mean it’s acceptable to let it go on any longer. It’s imperative that this tremendous waste of water is ended as soon as possible. Area residents are understandably concerned about the possibility of losing the lake, but should keep in mind that it’s not a naturally occurring one, and, like any landscape luxury, can be very costly to maintain over time. *An earlier version of this post showed the wrong number of zeros, owing to a misplaced period. 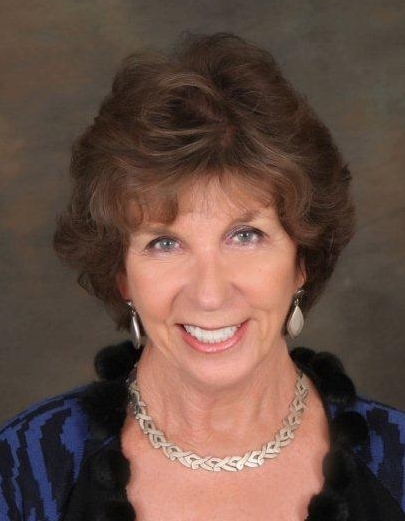 Outvoted 9 to 1 by political hacks and others who make up the rest of the OCWD Board of Directors, Ms. Flory is reported to have asked why OCWD needed Poseidon Resources to build a desalination plant when the district had already built it’s own Groundwater Reclamation System without a private vendor. Good question, and The Rag thanks Jan Flory for asking it, and for opposing the purchase agreement with Poseidon’s yet unbuilt plant—an agreement that would require the OCWD to purchase the water each year whether it was needed or not. Mr. Nelson also reports that several local politicians, including our own State Senator Bob Huff, sent representatives to shill for the project. 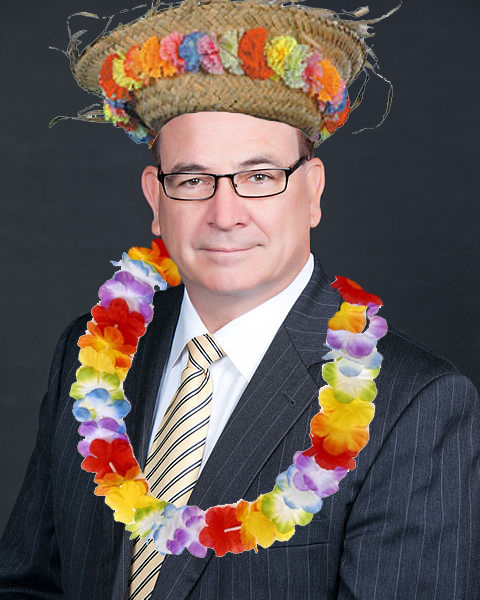 Senator Huff’s campaign was the recipient of $ 1,000.00 from Poseidon in the 2011-2012 election season. The central tenant of the late Marc Reisner’s classic work about water in the American West, Cadillac Desert, is that “water flows uphill toward money.” Senator Bob Huff and others continue to prove this adage true.